We spent a comfortable and relaxing couple of days and had all the comfort of home plus beautiful views and peaceful quietness. Enjoyed the great assortment of birds and company of deer. Very nice. We have stayed at this rental home twice and would definitely stay here again. Home is roomy, clean and has all amenities. So much better then a hotel! Home has beautiful views to relax and watch wildlife. You overlook a little pond and had Canadian geese and quail in our yard. One morning the Sequim Roosevelt elk herd was in the meadow! We love staying in this home! You are also extremely close to Sequim restaurants and shopping, but are in a secluded pasture land so it is very relaxing. We spent most mornings just relaxing at the home and enjoying the view from the house, before beginning our day of adventure. I moved from California and stayed here for over a month while my home in Sequim was being remodeled. This is in the country yet 5 minutes from downtown Sequim. Very comfortable, clean home, had everything needed for my extended stay. The geese had babies while I was there and I loved watching the family walk the property, elk grazed nearby and could view all this from the cottage. There is a lilac bush in the yard that was in bloom, beautiful scented flowers. I loved having the fenced yard for my little dog to explore living in the country. 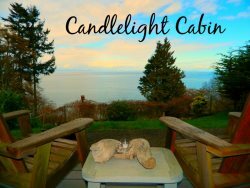 I cannot say enough about this property, it was my first home in Sequim and there is a special place in my heart for Cattail Cottage. Thank you for sharing your beautiful home with us! We really enjoyed our time here and made great memories with great friends. Your home is very comfortable and has spectacular views! We took the 11 mile journey to and from the lighthouse during our time here and although it was tiring, we had many laughs along the way and at least we can say we did it! This was perfect for us to get away with our friends. The two bedrooms worked out wonderfully. The deer visiting each day was a bonus to the view we could sit and look out over the water. We played games, put a puzzle together and visited the wildlife animal refuge. We would go again. The food at the marina was delish. We thoroughly enjoyed our 11 day stay in the Cattail Cottage. It was so quiet and peaceful. We loved seeing the quail running through the property every afternoon and the ducks swimming in the pond. The cottage is exceptionally clean and cozy. Also, it is beautifully decorated and has all the comforts of home. There is a huge apple tree on the property with the most delicious apples you have ever eaten. We cannot say enough good things about our stay. The owners, Warren and Maureen even gave us pears and tomatoes. It was a wonderful stay and we would definitely stay here again.